Last month were the Finals of the 2018 Miss Grand International (MGI) beauty pageant. The 6th annual pageant took place in Yangon Myanmar with 75 contestants from all over the world competing for the coveted crown. Lots of my pageant fans here have requested I talk about the Costumes as well as Evening Gowns of Miss Grand International as well as other beauty pageants that have happened (Miss International 2018) and are happening (Miss World 2018) so...better late than never, as they say--First off is the BLOG of my TOP 15 BEST COSTUMES from Miss Grand International 2018! 1. 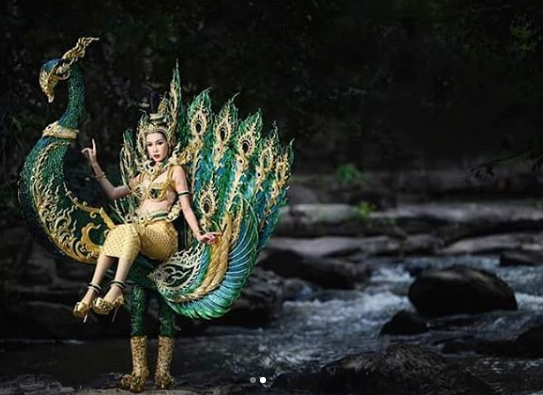 Miss Grand Laos Nobphalat Sikaiphak--This amazingly creative costume was my FAVORITE from all the designs shown at the Miss Grand International 2018 National Costume Competition Show. The design shows a mythical sequined peacock carrying a stunning Laos QUEEN through the river, propping her up so she will not touch the water. The design was incredible and really combines Costume Couture with creativity as well as paying tribute to the Laos culture and the New Year celebrations where beauties are seen on peacock floats. 2. 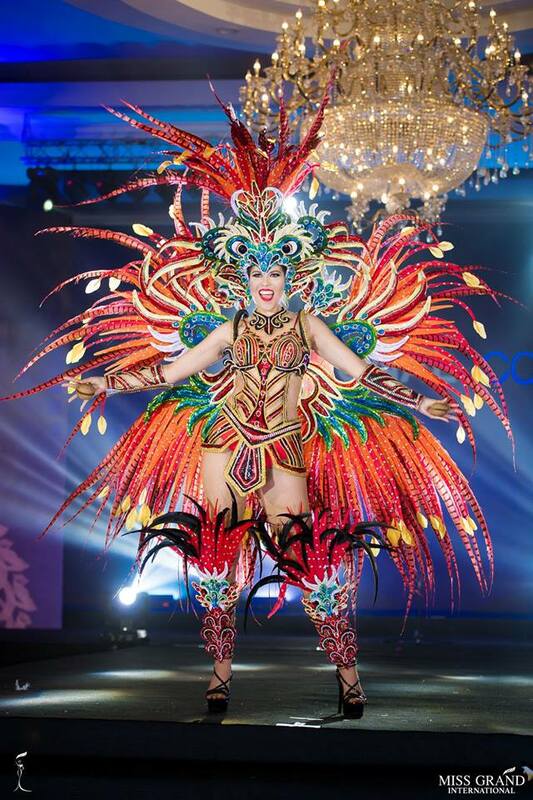 Miss Grand Peru Andrea Moberg--Miss Grand Peru 2018 actually won for the National Costume in this festive and once again, very creative design. 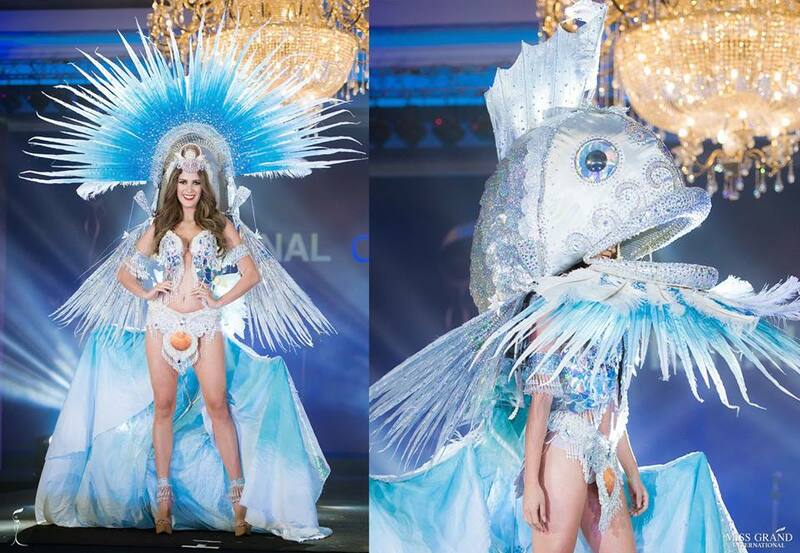 Andrea paid tribute to the wonderful variety of fish in her country with this national costume. Created by Beto Pinedo, the design pays tribute to the Amazon jungle representing the Doncella, a species of South American fish that has sustained generations of the natives of the Amazon jungle. As you can see the fabulous feathered headdress (left image) turns into a silver studded fish head once it is folded down (right image) adding a perfect exclamation point to an already beautiful costume. 3. 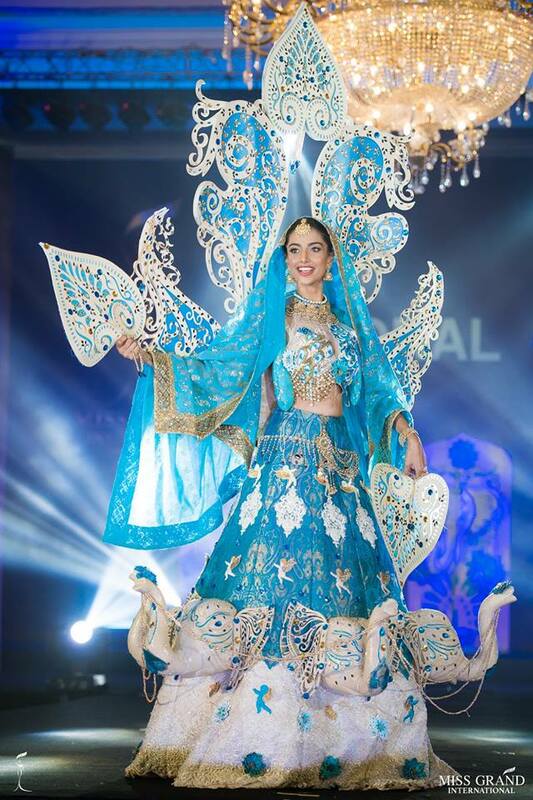 Miss Grand India Meenakshi Chaudhary--Miss Grand India 2018's costume was my third favorite. 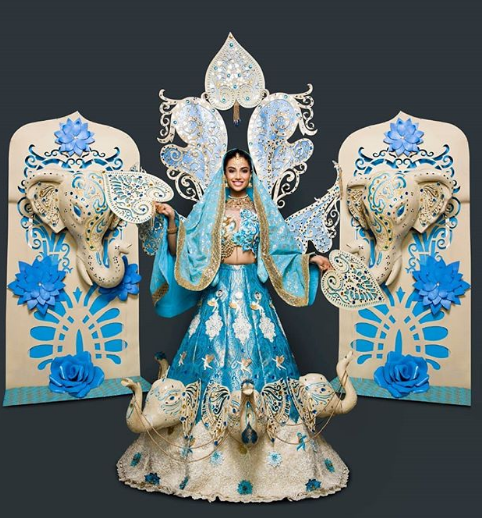 The design's theme was "Prayer of Peace, through the spirit of the Indian Elephant" and tells the whimsical story of a prayer of peace offered, through a scenic representation of the Mughal Empire's marble art and architecture. The costume features fabrics of woven silk and metal thread, in patterns of the Mughal Empire and turns a spear into a heart. So, in the colours of the peaceful sky; with the national flower - the lotus, representing beauty of ahimsa (non-violence) that can grow even in a swamp of conflicting thoughts; golden flows from the trunks of the elephants that equalize pure thoughts of peace to 'Amruth' (holy waters). Miss Grand India is representing the queen of peace in the royal splendor of the Mughal era; through a gate, that closes out the impurity of war; encouraging the world, that truth and spiritual beauty lies in our minds and we will see peace when we chose our thoughts like the spirited Indian elephant taking our prayers of peace to God. Simply incredible costume designed by Melvyn Noronda. 4. Miss Grand Costa Rica Nicole Menayo--Nicole's gold sequins and feathered costume represents the indigenous ancestors of Costa Rica. It is also inspired by the Pre-Columbian Gold Museum in Costa Rica. According to her Instagram, the belt symbolizes women’s natural reproductive cycle and the feathers are a tribute to other species that are our companions in this world, which deserve respect and caring, another value found in these groups. 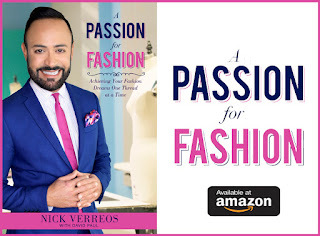 Fun fact: Designer Erick Bendana had only 3 weeks to design and make this peace of National Costume art. 5. Miss Grand Myanmar Su Myat Phoo--Su Myat's beautiful costumes pays tribute to Thadingyut The Festival of Lights. The costume, which includes a gold embroidered and black satin top, pants and jacket. 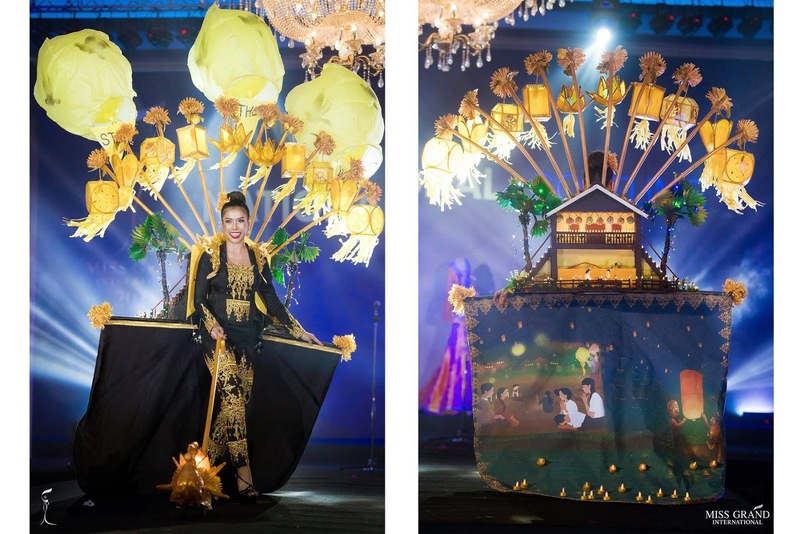 The jacket is adored with traditional gold lantern lights and features a meticulously constructed house (a house!) with palm trees in the back as well as a painted depiction of the Thadingyut. 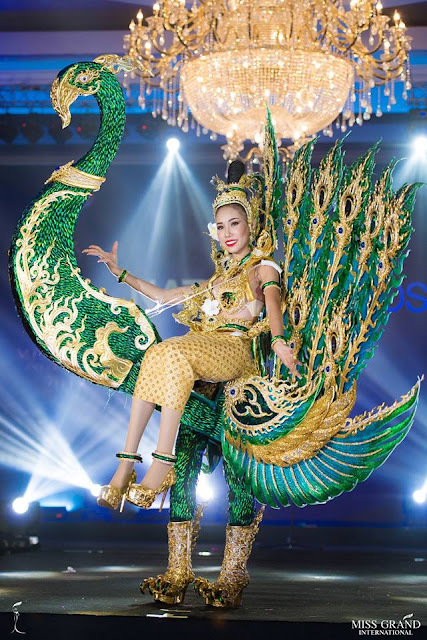 It's a fantastic costume that well deserves its place here in my Top Five of the Miss Grand International 2018 National Costumes. 6. Miss Grand Sri Lanka Pawani Vithanage--At Number 6, I placed Miss Grand Sri Lanka 2018 and this red and gold costume. The design, representing a somewhat mythical version of the Sri Lanka jungle fowl, which is the national bird of the country. 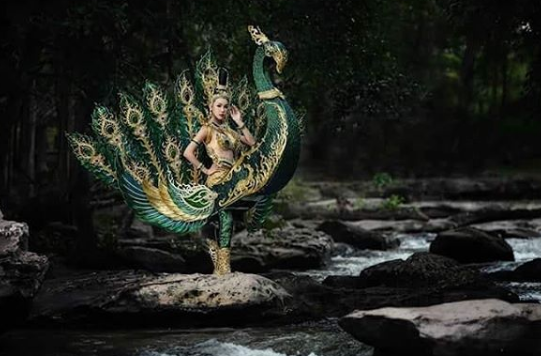 The costume is dramatic, impacting and combines both the costume narrative as well as nods to traditional Sri Lankan dress. 7. 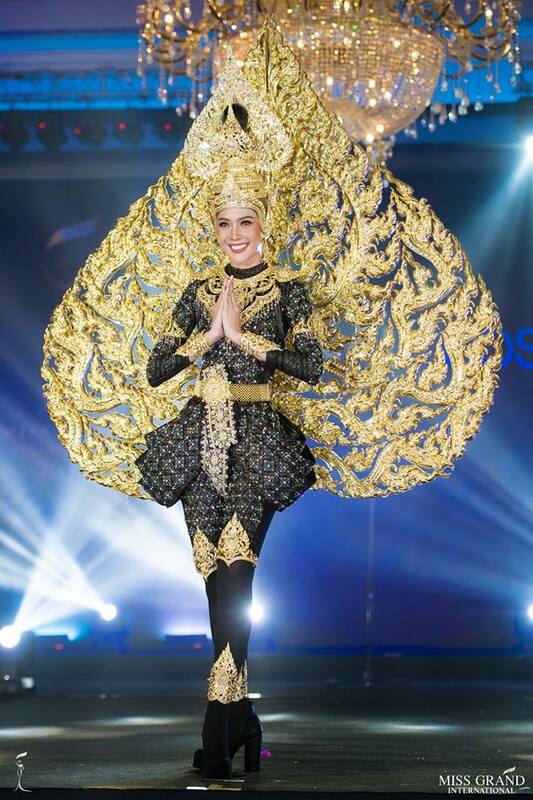 Miss Grand Thailand Moss Namoey Chanaphan--This Thai beauty stunned in this glorious costume representing the richness and elegance seen in Thai traditional garments as well as the exquisite adornments seen in the temples of the country. 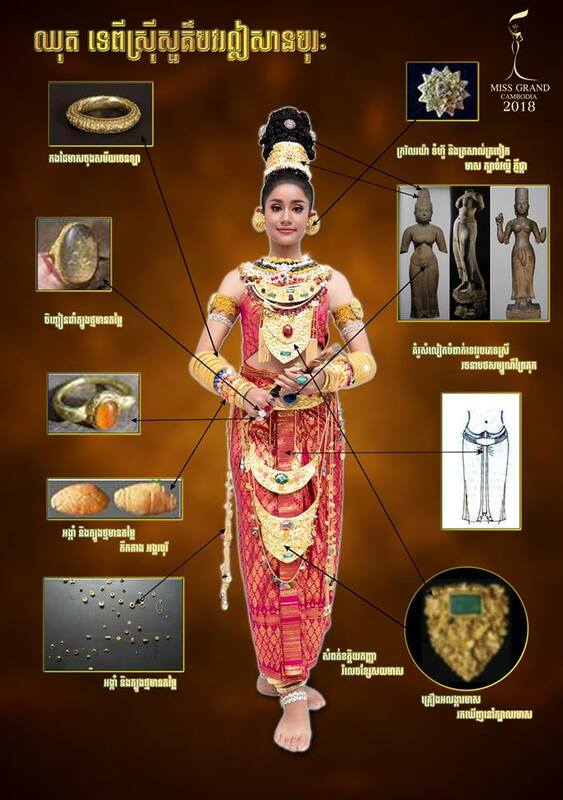 The ornate gold and crystal back piece is a work of art, exaggerating the shape seen in traditional Thai headdresses. I also loved the side draped costume which added a definite touch of High Fashion to this costume look. 8. Miss Grand Panama Gabriela Morhinweg--Gabriela's costume was one of my favorites in the Pre-Columbian Fantasy category which is always a popular choice, especially for the Latin American beauties. Her costume stood out for its bold, bright colors, it was well-executed and had strong stage impact. I loved how the feathers were delicately placed throughout and I also appreciated the nod to the Mola textiles of the Guna/Kuna indigenous people--native to Panama and Colombia--seen in the torso portion of the costume. 9. 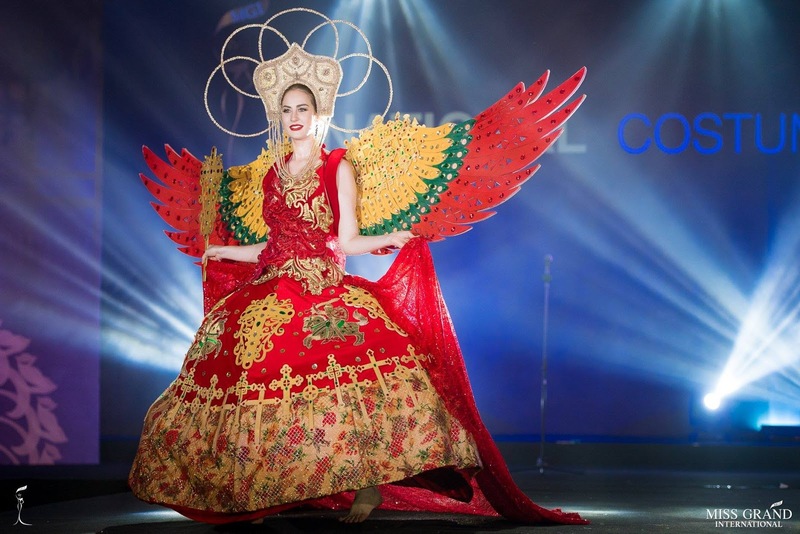 Miss Grand Japan Haruka Oda--Filipino designer Rocky Gatherole designed this fun and colorful national costume worn by Miss Grand Japan. The bubblegum pink design -plays homage to Harajuku cosplay and features a maillot, kimono sleeves, thigh-high hose and naturally, lots of Hello Kitty embellishments. I absolutely LOVED this costume for it made me smile, was original in not being a traditional Japanese Geisha dress and yet still, said JAPAN in capital letters! The costume took two weeks to make and only one fitting. Fabulous! 10. Miss Grand Tanzania Queen Mugesi Ainory Gesase--First off, how could I not love anyone named Queen Mugesi??!! 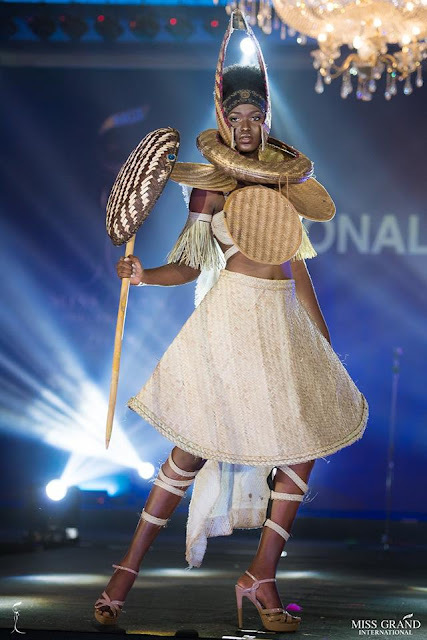 I thought this costume was probably the best from the ladies representing the African continent at Miss Grand International 2018. Her costume features traditional elements such as the woven straw skirt, neck "plates", head piece and armor. I loved the exaggerated shapes and overall stylish design. 11. Miss Grand Dominican Republic Maite Brito--Entitled "Queen of all the Beaches", Miss Grand Dominican Republic's national costume is an homage to all the country's beautiful beaches, showcasing the flora and fauna in all its gorgeous azure blue glory. The crown features pearls and sea shells against a palm background. The neck piece shows the prized "Beach Grape" as pearls and the body evokes the seashore in degrade. I especially admired the ample cape which represented the marine ecosystem and its diverse splendor showing starfish, shells and corals. I thought this was a great way to depict the Dominican Republic particularly as a wonderful destination for resort lovers. 12. Miss Grand Cambodia Lika Dy--Lika's national costume featured many elements of traditional Cambodian culture including the luxurious silk textiles, intricate gold jewelry, and even ancient sculpture. While it wasn't over-the-top impacting, it whispered with quiet richness and elegance. 13. Miss Grand Lithuania Jurate Stasiunaite--Designed by Indian designer Melvyn Dominic Noronha (who also created Miss Grand India's costume) this costume represents the "Queen of the Hill of Crosses". The design pays homage to this Lithuanian hill which features 3 crosses and is based on a coronation gown worn by the Grand Duchess of Lithuania. The costume features wings of the national bird--the stork--and has the colors of the national flag. Motifs of the armored knight of Lithuania complete the costume. I thought it was impacting, colorful and had stage presence. 14. 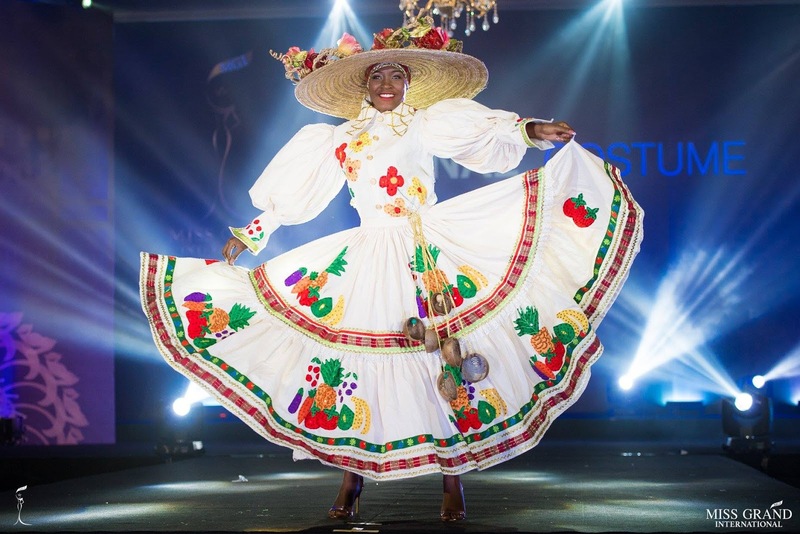 Miss Grand Haiti Valieri Alcide--Valieri wore this great version of the traditional Quadrille folk dress seen in many Caribbean islands. I loved the festiveness of it, the fruit appliques, the exaggerated blouson sleeves and THAT HAT!! I just wanted to go dancing with her! J'adore. 15. 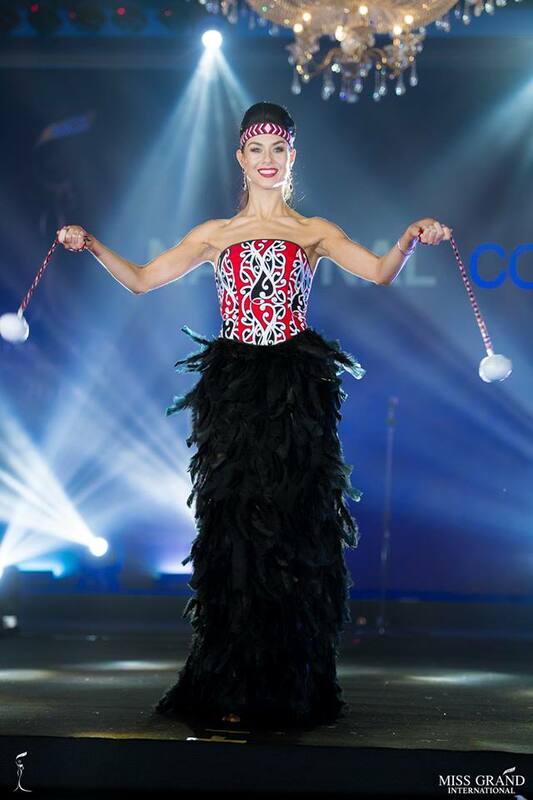 Miss Grand New Zealand Hayley Robinson--Representing her Maori culture, Hayley wore this black feathered with red/white/black Maori printed textile strapless gown and looked radiant in it! 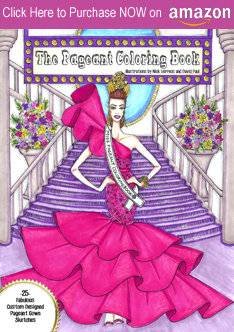 This literally could walk off the stage and be a gorgeous evening gown for a fabulous party! It should be the New Zealand version of the Indian sari! Love it. 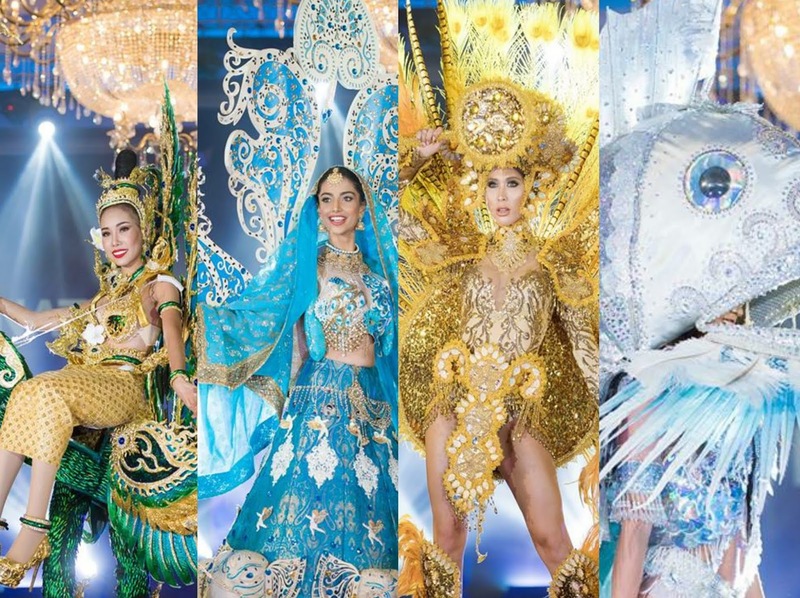 0 Response to "SASHES AND TIARAS.....Miss Grand International 2018 TOP 15 BEST NATIONAL COSTUMES"